The charter yacht GALILEO, a 123-foot Palmer Johnson ketch, is returning to New England this summer and is actively available for charters from July 1st through the end of September, basing in Newport but willing to relocate. 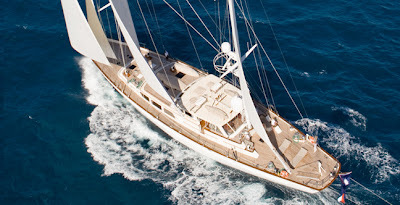 GALILEO is a 123-foot (38 meters) luxury ketch motor sailor designed for world cruising by Sparkman & Stephens with the classic interior design talent of John Munford, built at Palmer Johnson Yachts in 1989 and maintained in mint condition (refit 2009 – updated interior 2010). 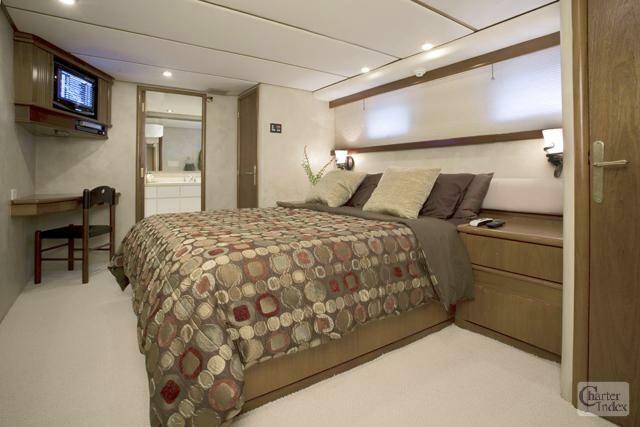 GALILEO can accommodate 6 guests in 3 cabins all aft of the salon: Master cabin with centerline king size bed, ensuite bath with tub / shower; Starboard guest cabin has a queen size bed, with ensuite bath & stall shower; Port guest cabin has 2 twin beds, ensuite bath with stall shower; Crew accommodations forward. 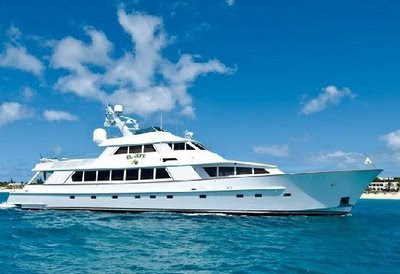 GALILEO will be available for charter in the Caribbean for the winter 2011-12 season. The charter yacht MIRA, a 70-foot Norlin/Sweden sloop, is pleased to introduce their delightful new chef, Athene Macrae. 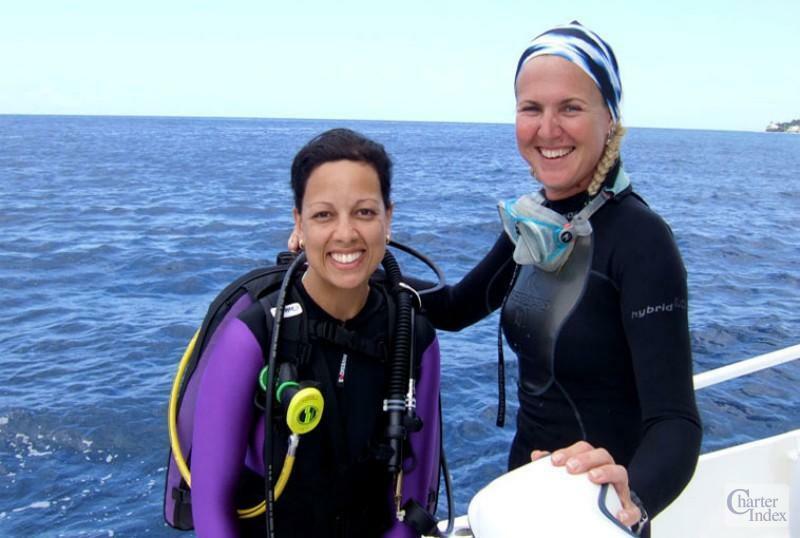 Athene, of British nationality, is most passionate about two things in life, culinary fare and the ocean, which makes her position on MIRA, the best of both worlds. 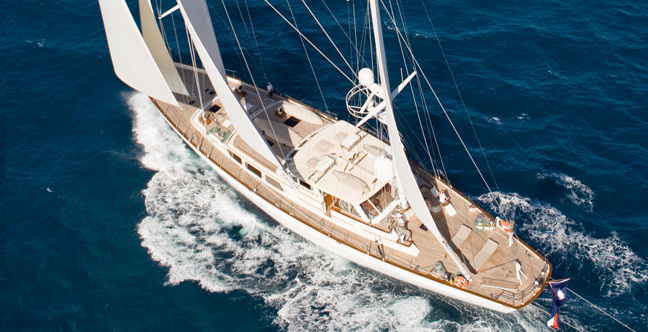 MIRA is ON THE MOVE and available for charter this summer in the West Med (Sardinia, Corsica and the South of France) and will also consider charters in the East Med (Croatia). Summer rates are: Euros 16,500/week, plus expenses. 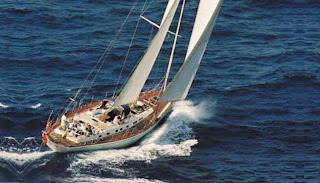 The charter yacht ANAHITA, a 62-foot Dynamique sloop, is offering two spots on their transAtlantic repositioning charter. The departure has been postponed to the end of May (around the 20th of May 2011). 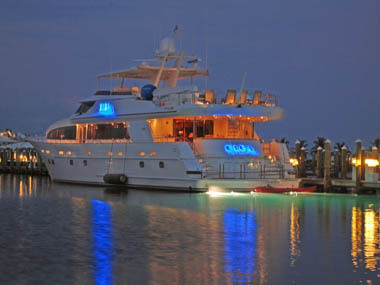 The charter yacht FLAME, a 65-foot Feadship motor yacht, is one of our favorite charter yachts in the Virgin Islands. Wayne & Barbara, owner-operators of Flame, have been chartering for 20-some years and they still enjoy sharing their boat and the islands with their guests. Jacob, the ship's cat has been aboard for about 5 years now, and is much loved by all. Way back when Wayne & Barb discovered Flame, she was in quite a state of disrepair (fire damaged as I recall, hence the name "Flame") but it was love at first sight. Flame's restoration and reconfiguration took a full three years and they did all the work themselves. 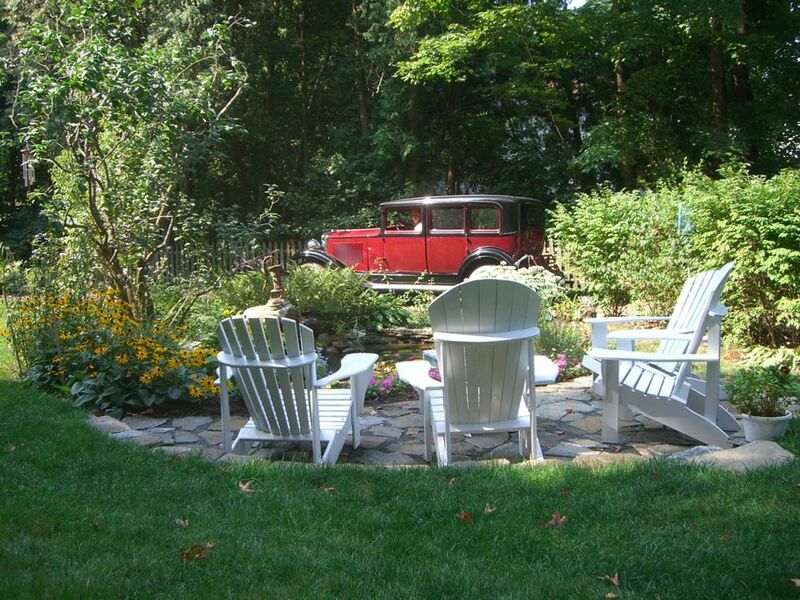 Their love for their home truly shows with the meticulous upkeep and maintenance they bestow upon her. A very fine vessel, indeed. Barb is well-known for her culinary skills and Wayne for his lobster-hunting talent. You can almost always bet on fresh seafood sometime during your week. You can find Barb's recipe for Shrimp and Lobster Risotto with White Truffle Oil in a previous post here. Honeymooners... Flame is a "one stop shop". Wayne can perform your wedding ceremony as he is an ordained minister. The charter yacht FREEDOM, a 120-foot Broward motor yacht, offers ALL INCLUSIVE (except fuel) yacht charters year round in the Virgin Islands. 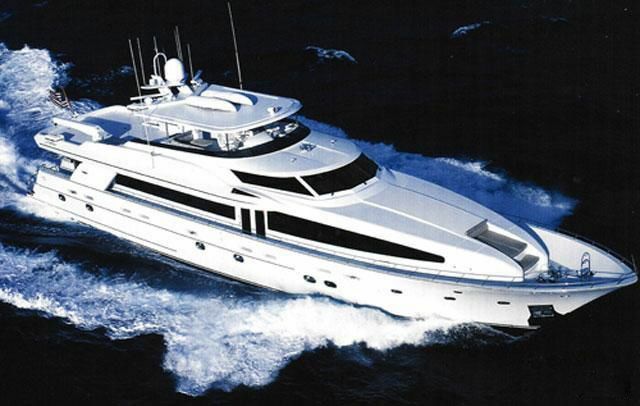 The charter yacht Freedom is a 120-foot Broward motor yacht with a crew of five. Based in St Croix they charter throughout the Virgin Islands. Freedom is fully air conditioned and accommodates up to 8 guests in 4 staterooms, each with private ensuite heads with showers. The master cabin has a King bed, two guest cabins have Queens, while the fourth cabin has lower twin berths with a pullman. Each cabin has an HD flat screen TV/DVD with a dedicated satellite receiver, and high-speed internet Wi-Fi is available. 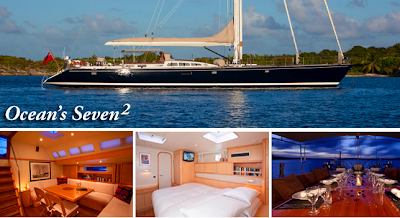 The charter Yacht OCEANS SEVEN SQUARED (or OCEANS 7²), a 104-foot Trehard sloop, has updated their online brochures. Exciting upgrades & new equipment -- both above & below decks ! OCEANS 7²’s interior has been redecorated in an elegant, monochromatic style with contrasts of red, and finished with classic Monks and Lunar nautical photographs – complimenting her beautiful ash paneling. 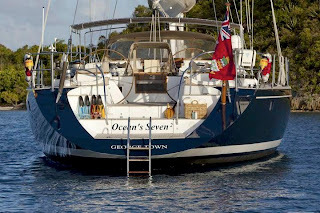 A new state of the art computer system has been added on board OCEANS 7² -- complete with upgraded on deck repeater. All of OCEANS 7²'s B & G Marine systems have also been upgraded with the latest generation. To enhance her already exceptional sailing performance, OCEANS 7² has brand new high-modulus carbon racing sails, special racing antifouling, and all new running rigging. The bow pulpit seat has been removed to allow more effective use of spinnakers and in addition the yacht now carries shorthand friendly downwind sails for use on charter. OCEANS 7²’s steering wheels are being replaced with high tech carbon / titanium models. OCEANS 7² now has kite surfing gear aboard which is suitable for beginner up to pro level. OCEANS 7² will depart Antigua this week for the Mediterranean and is available for charter beginning in the second week of June, basing this summer in Croatia. 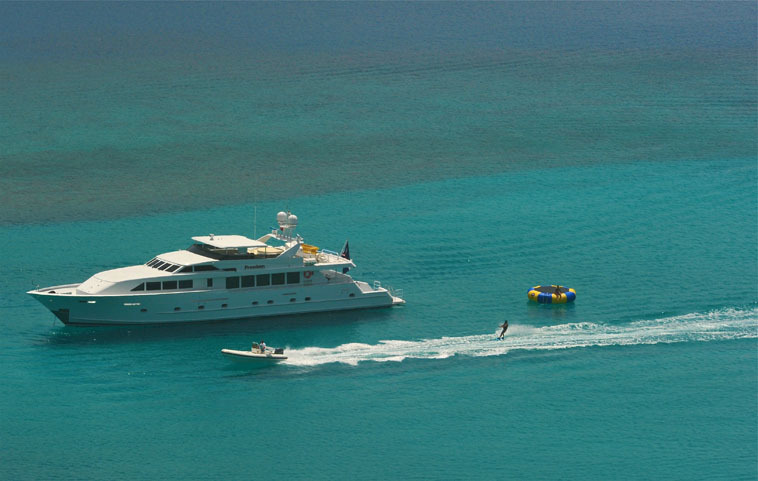 The charter yacht EL JEFE, a 115-foot (35.05m) Derektor Tri-Deck motoryacht, is offering ALL-INCLUSIVE charters in St. Martin and the BVIs at affordable rates! El Jefe is 115-foot Derektor Tri-Deck Motoryacht and accommodates up to 10 guests in 4 staterooms (3 Queens & 1 Twins with pullmans). The spacious King master stateroom located on the forward main deck complete with flat screen TV and state of the art body spray showers. The two Queen staterooms are equipped with flat screen TVs, cedar lined closets, marble counters, and body spray showers. The Twin stateroom has two lower twins with additional Pullmans which can accommodate up to four guests, and also has flat screen TVs and marble counters. 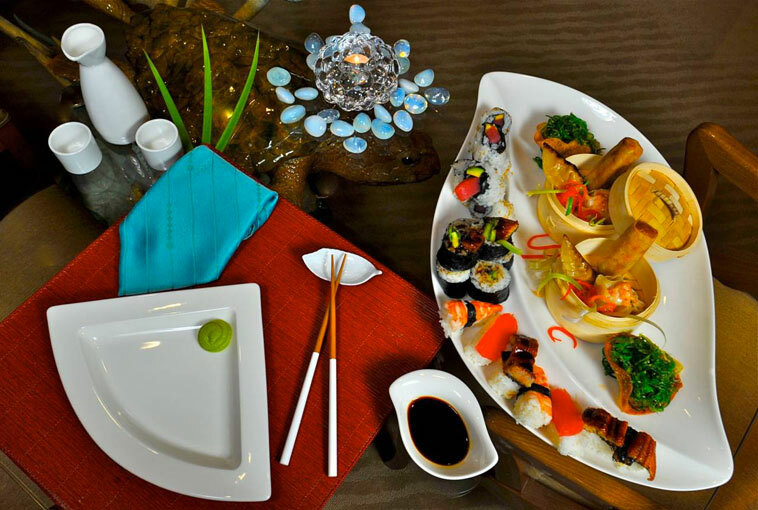 EL JEFE's inviting and fun furnishings compliment the attractive interior decor. 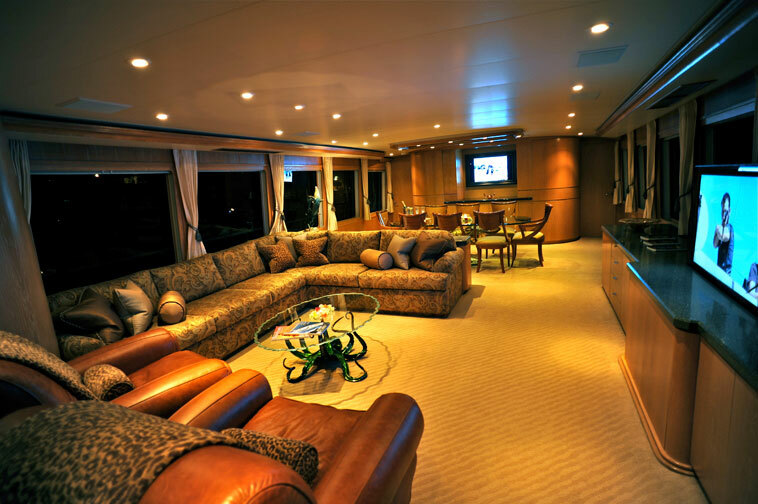 The main salon has a comfortable socializing area, as well as, a formal dining area midship, which can comfortably seat up to ten guests. The sky lounge is complete with a full entertainment system with TV/CD/DVD, as well as another full bar. On the aft deck which leads down to her swimming platform, an ‘al fresco’ dinning table can seat 10 guests. EL JEFE’s Sun Deck has additional seating for 10 more guests as well as outdoor barbeque, jet skis, flat screen TV and bar station. 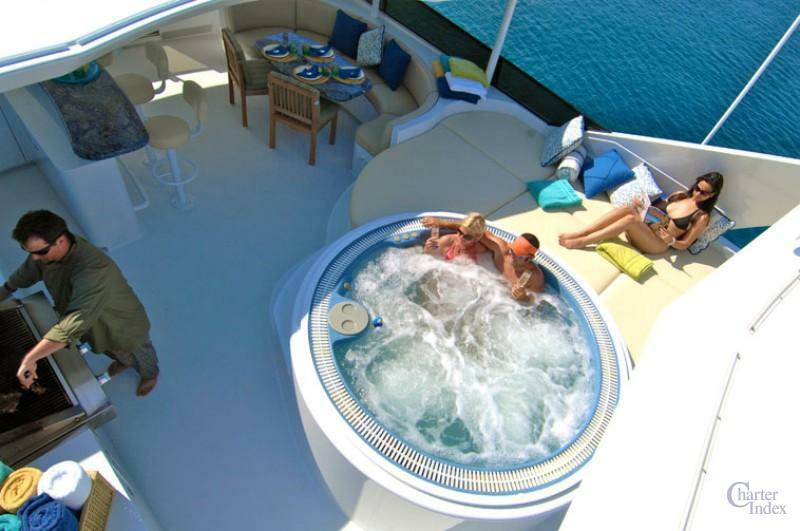 The Fly bridge boasts a semi covered sun bed, a full wet bar and an 8 person Jacuzzi/hottub. Other amenities on board include world wide central WIFI communications, TV, fax and phone. Includes: Diesel fuel for 2 hours cruising and generators cumulative, gasoline for 15-foot Caribe tender/personal watercraft, chef's menu (3 meals/day, snacks), standard bar (alcoholic & non-alcoholic beverages), landing fees for pickup and drop off, unlimited use of tender/ water toys. Optional: 35-foot Marlin towed tender available for additional $2000/wk, includes fuel. Charter Yacht OLGA, a luxury 121-foot Crescent motor yacht, is offering ALL-INCLUSIVE crewed Caribbean charters this summer in the Virgin Islands. 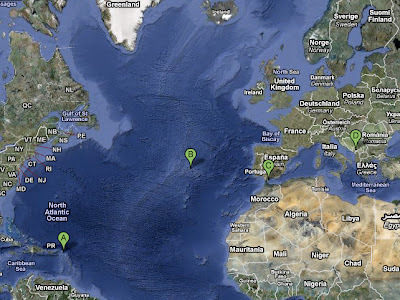 Charter fee includes: fuel, food, soft drinks, ship's bar, and selected dockage. 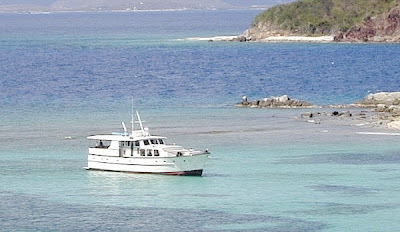 Special rates are valid for charters taking place between May 15 and September 1, 2011. 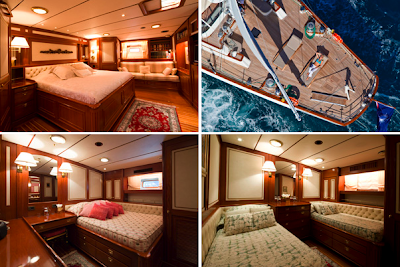 The charter yacht OLGA is a 121-foot Crescent motor yacht, fully air conditioned and accommodates up to 8 guests in 4 staterooms, plus there is an additional child's cabin, all with ensuite heads. The master has a King, two staterooms have Queens, one stateroom has 2 lower twin beds, and the child's cabin has a single bed and a pullman. Captain Bernard Calot, along with his 5 exceptional crew (including a certified massage therapist), look forward to having you aboard this summer. The charter yacht MATELOT, a Bruce Farr Southern Wind 80, is offering a 20% discount for June 2011 yacht charters in Croatia. 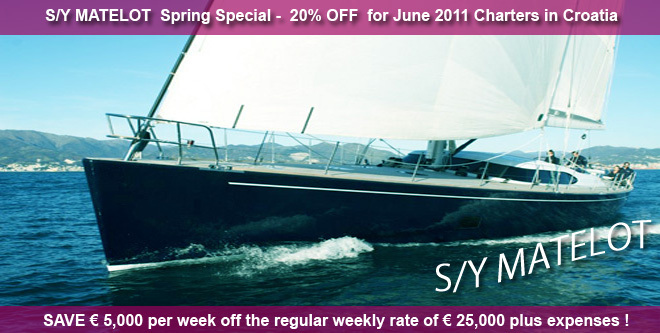 Confirm your charter before April 30, 2011 and save 5000 Euros off the regular weekly rate of €25,000 (plus all expenses). Matelot is available in Croatia beginning June 1, 2011. The crewed charter yacht Matelot, a beautiful 80-foot Bruce Farr/Southern Wind sloop, offers three comfortable guest staterooms plus performance sailing. 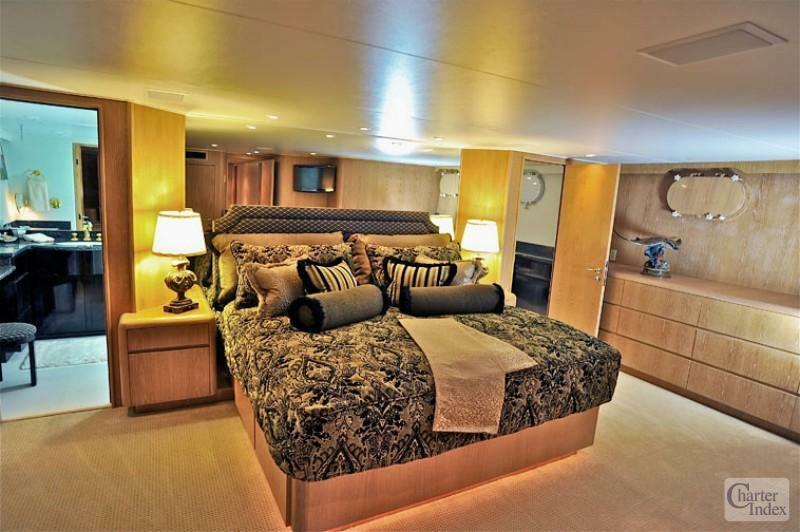 The full beam Master Stateroom located forward of the panoramic deck salon has a walk around king bed, settee & vanity / writing desk, ensuite bath with stall shower. 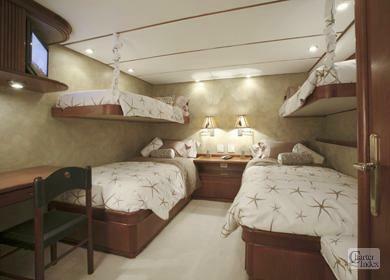 Two identical guest cabins amidships, aft of the salon each have twin lower single beds with ensuite heads & stall showers. 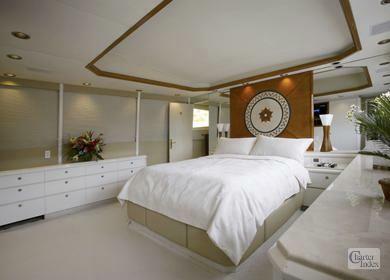 Crew quarters and galley are fully aft with separate companionway. MATELOT is in "like new" condition following her winter spent in the shipyard in New Zealand. 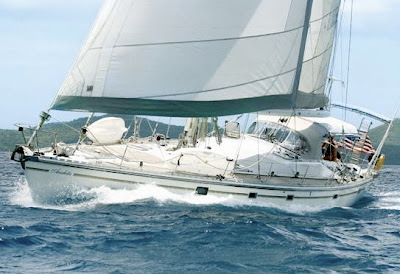 Charming veteran British crew are Captain Angus Fuller & chef Jessie Fuller (+1) who have several seasons of busy chartering in Croatia and the Adriatic and are happy to make itinerary suggestions. Looking Ahead --> MATELOT will return to the Caribbean for the winter 2011-12 charter season and will be available anywhere from the BVI to Grenada. 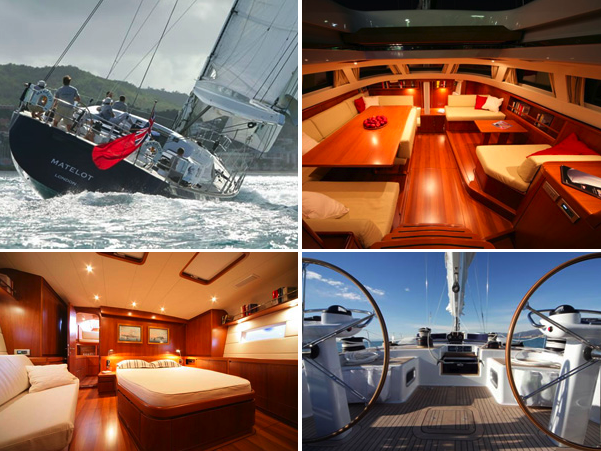 Charter Yacht Catamaran NEMO for Easter and SAVE!